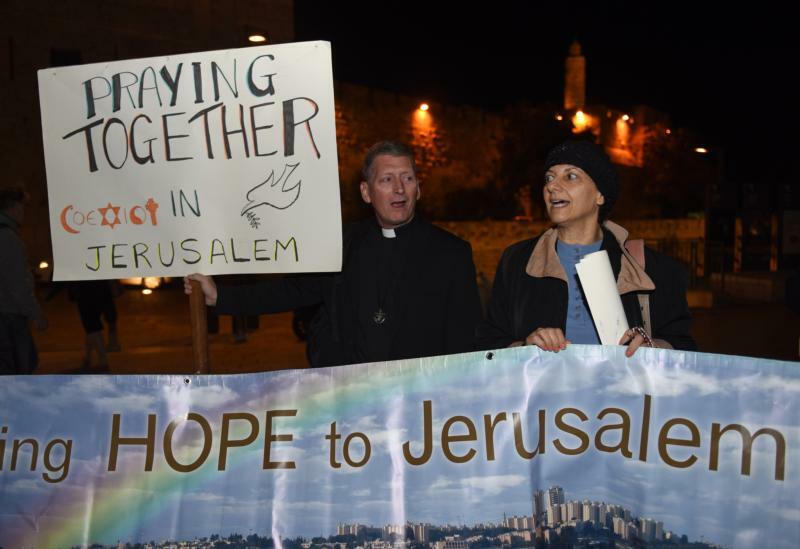 JERUSALEM (CNS) — As dusk fell over the Old City Oct. 29, a group of 60 Christians and Jews and one Muslim gathered at the entrance of the Jaffa Gate for what they hope will become a monthly event of public prayer for peace. The effort is the most recent among few prayer initiatives giving people of different faiths the opportunity to offer their own prayers for peace in Jerusalem. Father McDougall together with Peta Jones Pellach, an Orthodox Jewish woman who is director of educational activities at the Elijah Interfaith Institute, initiated the idea of a monthly parallel prayer service following a reunion of Abrahamic faiths at Tantur over the summer. “I do believe all our prayers are headed in the same direction and can be a really powerful force coming together. I don’t see it as just symbolic. I believe in the power of prayer,” Pellach said. The Rev. Kristen Brown, a United Methodist Church minister, said prayer can make a difference, especially during a time of rising tensions among Israelis and Palestinians. “Now is as crucial a time as any for people to come together to pray for peace with justice for all humanity,” she said. Though no one involved in the parallel prayer were native to the Holy Land — most were ex-patriates from English speaking countries — Pellach said she was not discouraged. “People from all parts of the world can come here,” she said. Abdullah Mohammed, the lone Muslim who joined the service with his prayer mat from his community in the desert skirting Jerusalem, said he came because he believed all were the children of Abraham. He said he did not know why other Muslims did not attend. Moments later, however, Mohammed was not present as the Christian and Jewish groups gathered for their parallel prayers, which allowed each group to pray according to their own faith. It might be too delicate a time for Muslims to be seen praying together especially with Jews, Father McDougall suggested. “Some may just be afraid with the atmosphere in the Old City,” he said, adding that perhaps if a prayer is held in a less public spot such as the Tantur institute in the future, it will be easier to gather Muslim participation. As she passed the group and noticed their sign, Nili Shafai, 58, a Jewish visitor from Los Angeles, stepped away from her guide and thanked the group for their prayers.